Ok.. So I'm back in Philly.. Again. So what's the difference between a Stromboli and a Calzone, you ask? Well, according to Wiki, both are made from Pizza Dough pockets which are filled with Cheese and/or your choice of Meat and Toppings that are folded over, but the Calzone is folded over once, sorta like a giant Empanada, in a half moon shape, and the Stromboli is rolled into a Loaf, sorta like a flattened Burrito. The picture above is a photo of a Cheesesteak Stromboli and the pictures below are ones of a Cheesesteak Calzone that I had at a place in Atlantic City, that was actually called a Cheesesteak Stromboli on the Menu. Meat + Cheese = YUM! Someone in SF once told me that after drinking on a gluttonous night in Philly, they bought a Jim's 'Steak on South Street and then went and got a Slice at Lorenzo's Pizza and proceeded to wrap the Slice around the 'Steak and eat it. I kid you not. Now seriously... That sounded just plain ludicrous to me! 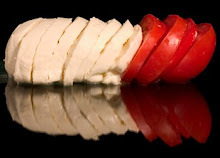 In the West Coast, some people's idea of the 'Perfect Food' is the Burrito. While in the East Coast, we have our Pizza (NY) and Cheesesteaks (Philly). 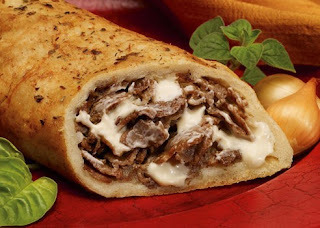 The Cheesesteak Stromboli is the best of ALL worlds wrapped into One! For the Happy Ending to this Piece, Grab yourself a Rita's Water Ice!